From the above examples, nameSet and cityMap allows all the three values because set and map key treat the values with different case as different values that means set string values are case-sensitive. Use the below method before adding string value to set or map key. How to use above method? When will focus come to date field on a visualforce page load? 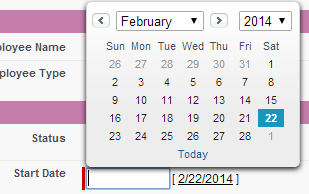 If the first field is the date field then whenever user try to open the visualforce page focus will be on date field. Note: If you have pick list field as the first field then focus won't be on that field. Example if you have two pick list fields followed by date field then focus will be on date field not on pick list fields. Add below line of code to your visualforce page.